Indonesian Foreign Minister Retno Marsudi asked Sergey Lavrov to offer a visa-free access in Russia for Indonesian tourists. Indonesia officially requested Russia to offer a visa-free access for Indonesian tourists, under the principle of reciprocity, sources close to the Indonesia Foreign Ministry told RBTH. 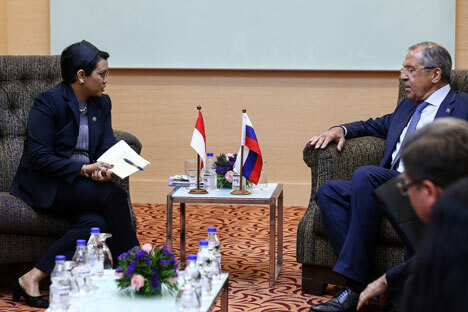 The request was made by Indonesian Foreign Minister Retno Marsudi when she met her Russian counterpart Sergey Lavrov, on the sidelines of the Russia-ASEAN Ministerial Meetings in Kuala Lumpur this month. The sources told RBTH that Lavrov said the matter would be considered. Russian citizens visiting Indonesia for tourism, casual business or visiting friends and relatives have one-month visa free access. Russia offers similar visa-free access to citizens of Thailand and the Hong Kong Special Administrative Region of China.